The ROCK & ROLL database system cleanly integrates deductive and object-oriented capabilities by defining an imperative programming language, ROCK, and a declarative, deductive language, ROLL, over a common object-oriented (OO) data model. 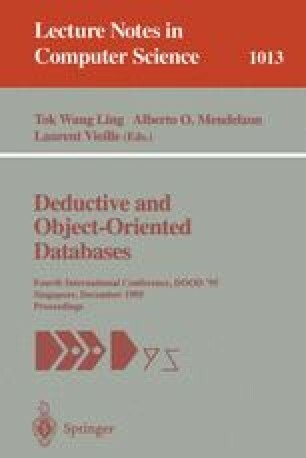 Existing techniques for evaluation and optimization of deductive languages fail to address key requirements imposed by ROLL such as: strict typing; placement of deductive methods (predicates) within classes; encapsulation; overriding and late binding. This paper describes the task of implementing an evaluator and optimizer for ROLL, explaining how existing implementation techniques for deductive languages were adapted to meet these requirements and extended to support novel types of optimization.